Two shootings in London in the space of an hour - including a drive-by attack - have left a 17-year-old girl and a boy, 16, dead. Friends said the girl, named locally as Tanesha Melbourne, was killed "for no reason" in Tottenham on Monday night. The Met has confirmed she died when "shots were fired" from a vehicle as it drove past a group of young people. Two miles away, in Walthamstow, the boy was found with gunshot wounds, with another boy, 15, who had stab injuries. The boy who suffered gunshot wounds died later in hospital, police said. Both attacks come amid concerns over rising violent crime in London. Police say the shootings are not linked. Tanesha, whose name has not been officially confirmed, was pronounced dead at 22:43 BST near Northumberland Park, Tottenham. Grieving family members and friends left floral tributes and candles at the scene in Chalgrove Road on Tuesday. One friend described her as a "very lovable little girl in the community, she was not involved in any sort of problems with anyone". Tyesha, 21, who knew Tanesha, told the BBC she was "just chilling with her friends" when she was shot. "The car just pulled up and just started shooting," she said. "Her friend came banging on my door so I came out quickly. I even tried to save her - had to, had to." She said the gunshot wound, below the victim's breast, was not immediately visible and it looked like she was "having a fit". "I put her on her side and I was just rubbing her back, saying 'Everything's going to be OK'. I just can't believe it - so young. It's ridiculous now." A witness said a woman, believed to be the victim's mother, began "screaming" when she discovered the girl shortly after the shooting. Det Ch Supt Richard Wood described the attack as "terrible". "At this stage we're keeping a completely open mind, it's too early to say what the motive is or indeed if it's just a case of wrong place, wrong time," he said. "We do know that a vehicle drove past a group of young people, shots were fired from the vehicle and sadly the young lady lost her life." Are black knife deaths being ignored? Can Scotland help London stop violent deaths? David Lammy, Labour MP for Tottenham, said he was "deeply worried" about London's rise in violent crime - particularly in his area. "There is no single cause, but there has been a big spike in both gun crime and knife crime across London," he said. "Certainly my constituency finds itself at the epicentre of that." He said cuts to police budgets meant fewer neighbourhood officers on the streets who were "able to pick up intelligence" within communities. A local resident, who did not want to be named, said she heard multiple shots, which sounded like a "bomb" exploding. She said: "It's not nice. I've lived here for 40 years, and in the last two or three years it's become not a nice place. "There are so many drugs, stabbings and killings." The community in Tottenham has already been gripped with grief and shock that a young woman has had her life ended so tragically. I'm told there were dozens of people out until 02:00 BST consoling each other, while other residents woke to see police cordons and press at the scene. There was a poignant silence when the body of the 17-year-old was taken away, broken only by the sound of people crying. In this area there are people - no matter what age - who are fearful. Residents spoke about self-imposed curfews and mothers not letting their children out after 19:00. Amid the sadness, there is also anger and questions over what the Mayor of London is doing. Another neighbour, who did not want to be named, said stabbings were common in the area. The Tottenham resident said: "It's so violent around here. I nearly got stabbed the other day. If you've been around Tottenham a long time you get it." Watch: "My kids don't see this side of me"
One witness, who works in a nearby shop, said he heard three distinct bangs, which sounded like "fireworks". He said he saw the victim with blood on her chest sitting with friends following the shooting, before police cars and ambulances arrived. Close to the scene, residents held an impromptu celebration of Tanesha's life until the early morning. "We were out here until one o'clock in the morning," a neighbour said. "It was really heart-breaking. We were here for ages but clearly she was already gone." School friend Candice Hassan said she found out about the murder on social media just half-an-hour after the shooting. "It was shocking. Everyone's upset obviously - one minute I see her and the next minute I don't," she said. "One hour before her death, I saw her on Snapchat - one hour before she got shot. Everyone knows Tanesha, she's just a humble girl. "It was just the wrong place at the wrong time. She didn't deserve any of that." 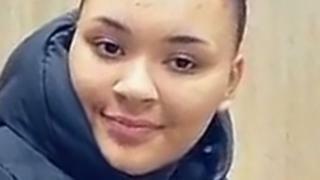 The 17-year-old, who went to the Gladesmore Community School with Tanesha, added: "I have heard it was a drive-by shooting - obviously gang-related - Wood Green and Tottenham." Formal identification has yet to take place. However, Tanesha's next-of-kin have been informed of her death. The Walthamstow crime scene, in Markhouse Road, is just over two miles (3.5km) from the site of the Tottenham killing. Stella Creasy, Labour MP for Walthamstow, said the 16-year-old boy was taken to a hospital in east London. He had been in "intensive care". Scotland Yard said the 15-year-old boy who was stabbed in Walthamstow has life-changing but not life-threatening injuries. There have been no arrests in either investigation. It brings the total of fatal shootings in London this year to seven, including one man who died after being shot and stabbed. A Downing Street spokesman said: "There can be no place in our society for violent crime. The government is determined to do everything it can to break the cycle. "We have already consulted on new laws on offensive and dangerous weapons, including banning online stores from delivering knives to residential addresses and making it an offence to possess certain weapons in private."